Google is pulling its popular YouTube video service from Amazon's Fire TV and Echo Show devices in an escalating feud that has caught consumers in the crossfire. The decision to block YouTube is retaliation for Amazon's refusal to sell some Google products that compete with Amazon gadgets. 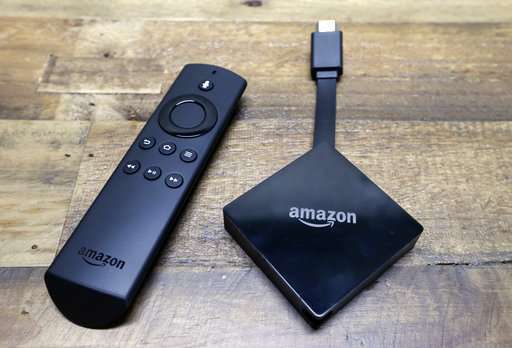 That includes Google's Chromecast streaming device, an alternative to Fire TV, and an internet-connected speaker called Home, which is trying to catch up to Amazon's market-leading Echo. Amazon's high-end Echo Show has a screen that can display video. "Given this lack of reciprocity, we are no longer supporting YouTube on Echo Show and Fire TV," Google said in a Tuesday statement. The battle highlights the power that the world's major technology companies are gaining as they dominate important corners of commerce and communications. As the world's largest online retailer, Amazon has tremendous sway over what people buy, while the results delivered by Google's ubiquitous search engine often help determine what people do on and off the web. Google is hoping to pressure Amazon into selling Google's products by taking away access to the world's most widely watched video service. Unless a truce is reached, YouTube will stop working on Fire TV on Jan. 1. YouTube was supposed to disappear from the Echo Show Tuesday, although Amazon has previously found ways to make unauthorized versions of YouTube available on that device. The dispute between Amazon and Google mirrors the face-offs that occasionally crop up between pay-TV providers and TV networks when it comes time to re-negotiate their deals. But in this instance, the two tech heavyweights aren't fighting over licensing fees. Instead, they are jockeying to position their gadgets and, by extension, their digital services into homes as internet-connected appliances and devices become more deeply ingrained in people's lives. The bickering between Google and Amazon has been going on several years as they have ratcheted up the competition with each other. One of the first signs that the companies were at odds came when Amazon redesigned Google's Android mobile software for its Kindle tablets. Two years ago, Amazon ousted Chromecast from its store, even though that device had previously been its top-selling electronics gadget. The latest standoff between Google and Amazon was ridiculed by a trade association of high-speed internet providers. The group, USTelecom, has been trying to persuade skeptics that internet providers will preserve equal access to all digital services, even if the Federal Communications Commission adopts a proposal to rescind current "net neutrality" regulations . Internet providers are committed to "protections like no content blocking or throttling," said USTelecom CEO Jonathan Spalter. "Seems like some of the biggest internet companies can't say the same. Ironic, isn't it?" Besides withholding Chromecast and the Home speaker from its store, Amazon has also rankled Google by declining to sell an internet-connected thermostat made by Nest, which is owned by Google parent Alphabet Inc. Amazon also doesn't allow its Prime video streaming service on Chromecast, an omission that Google wants to change. Amazon also doesn't sell Apple's video streaming player. But that could change if Amazon's video streaming service starts working on Apple TV, something Apple has said would happen by the end of this year. But that announcement was made in June and Prime video still isn't available on Apple TV. Roku's market-leading streaming players are sold through Amazon. Roku's players feature channels for watching both Prime video and YouTube. A charming foretaste of the kind of things that could happen on a non-net neutral internet when corporate interests collide. Go on then, explain how obama's "net neutrality" law would have in any way prevented or even have affected this action. This should be amusing. I despise Amazon. They were the ones who colluded with companies to prevent cross-border sales of electronic devices, forcing non Amazon.com customers to look elsewhere or pay ridiculously outsized prices for these things. Amusingly, you did not understand that this is simply a demonstration of corporations blocking each other with technology they control. The tech involved here is not Internet connections, but rather endpoints (servers and devices.) However, without neutrality rules, there is nothing to stop corporations from bringing the Internet connectivity of their captive customer bases into the fray by blocking, degrading or charging extra. Unlike the Internet, one can switch to alternative devices and services. I have only one viable high speed provider. I'm screwed if it starts playing games in the interest of its corporate owners other products.